As a child, I loved hot dogs. In fact, if it were not for dietary concerns, I would still be eating them. And as you descend the slippery slope of fast food and stratospheric calories, you might as well throw in some French fries. On my recent pilgrimage to Coney Island, which I wrote about yesterday, four of us decided to stop by the original Nathan's Famous on Surf and Stillwell Avenues in Brooklyn, started in 1916 by Nathan Handwerker. I wrote of Nathan's in 2006 - you can read it here. We had decided to snack only and ordered French fries and fried clams. For myself, since I eat fries so infrequently, there are only good fries or very good fries. What's more American than hot dogs and fries? Eating to excess, so a hot dog eating contest is the perfect American sport. 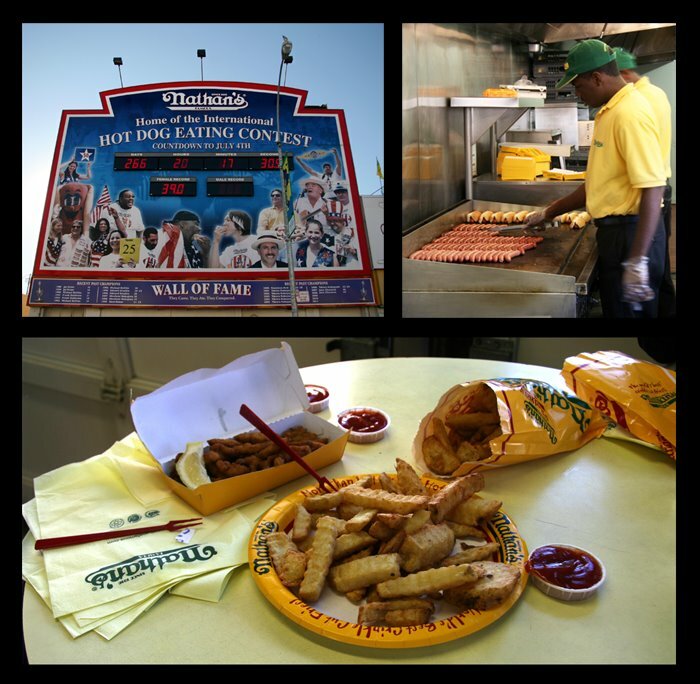 Since 1916, Nathan's has been sponsoring a hot dog eating contest. In 2007, the Japanese hegemony was finally broken by Joey "Jaws" Chestnut, eating 59 dogs in 10 minutes, beating Takeru Kobayashi who had held the record for 6 years straight.